Marketers looking to grow their business or even maintain their bottom line are increasingly looking to the LGBT market to achieve their business goals. In this second blog of the LGBT series tied to our 2013 LGBT consumer report, we’ll leverage consumer segmentation systems developed by Experian Marketing Services to examine key groups of LGBT consumers when it comes to automotive and food lifestyles. We’ll also illustrate why mobile campaigns are incredibly important in reaching these tech-savvy, mobile-oriented consumers. Gay men have a reputation for their attention to style and presentation and our Food Lifestyle segments indicate that’s at least partially true when it comes to food. 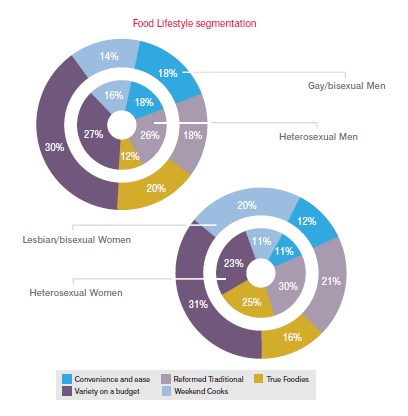 Our research shows that when compared to heterosexual men, gay and bisexual men are 59% more likely to be considered “True Foodies,” the segment of eaters who have the most culinary expertise, eat a wide variety of food, love to experiment with different cuisines and have adopted a healthy eating lifestyle. In fact, fully one-in-five gay/bisexual men (20%) fall into this segment compared with 12% of straight men. On the opposite side of the gender divide, lesbian/bisexual women are actually less likely than heterosexual women to be True Foodies with only 16% of lesbian/bisexual women falling into this segment compared with 25% of heterosexual women. Both gay/bisexual men and lesbian/bisexual women are more likely than their heterosexual counterparts to be considered “Variety on a budget,” a segment that often eats on the run, yet wants food that’s healthy and gourmet. Cul-de-sacs represent practical drivers who place a higher value on comfort and function over performance, image or status when buying a vehicle. Meantime, City Streets includes drivers who see their vehicle as an extension of their identity and whose primary motivations when selecting a vehicle are image and status. The fact that gay/bisexual men are over represented in both “Cul-de-sacs” and “City Streets” may seem contradictory, but it actually highlights the importance of getting a more complete understanding of LGBT consumers and discovering sub-segments within the overall community. Gays, lesbians and bisexuals are mobile and technology leaders. Compared with heterosexuals, gay/bisexual men and lesbian/bisexual women are more likely to be considered technology “Wizards.” Wizards are those consumers Experian Marketing Services has identified as those for whom technology is central to their way of life. They’re enthusiastic and adventurous users of new technology and can’t get enough of the latest gadgets. 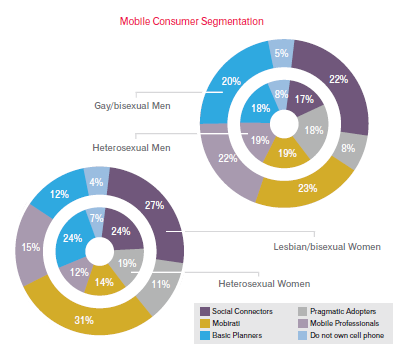 When it comes to mobile, both gay/bisexual men and lesbian/bisexual women are more likely than their heterosexual counterparts to be members of highly active segments from our Mobile Consumer Segmentation that are key for marketers trying to connect with mobile innovators. Specifically, gay, lesbian and bisexual adults are more likely to be considered “Social Connectors,” “Mobile Professionals” and “Mobirati.” In fact, lesbian/bisexual women are fully 2.2 times more likely than heterosexual women to be Mobirati, which represents those adults who grew up with cell phones and can’t imagine life without them. As added proof that these consumer segments are important targets for mobile campaigns, our research shows that gay/bisexual men and lesbian/bisexual women are 33% and 22% more likely than their heterosexual gender counterparts, respectively, to have redeemed a coupon from their cell phone. This post is part of a series on the LGBT consumers. Read our first post, to learn what marketers need to know about LGBT consumers. The LGBT consumer report is based on the Simmons® LGBT Consumer Study, the only syndicated, national probability sample survey that measures the lifestyles, attitudes, media habits and brand preferences of the LGBT population giving marketers actionable insights into this powerful consumer segment that can be directly compared with those of heterosexuals.